At 3:30 p.m. on April 25, 1792, a robber and killer named Nicolas Pelletier was led to the scaffolding in the Place de Grave, where public executions were performed during the reign of Louis XV. Plentiful national guardsmen were on the scene to preserve order. The authorities were concerned that the crowd for this execution would be unusually large and rowdy, as this was the very first time the guillotine would be used to put a convicted felon to death. The condemned prisoner walked up the stairs wearing a bright red shirt, and was quickly positioned on the guillotine, also bright red in color. Within seconds, the blade fell, Pelletier was decapitated, and it was all over. But the guillotine was here to stay. There had been other devices similar to the guillotine previously in existence in Europe, but the machine we know today was developed by Dr. Joseph-Ignace Guillotin, a French doctor and member of the Revolutionary National Assembly. The good doctor was actually against the death penalty, but he figured a more humane method of execution was better than nothing until capital punishment could be abolished completely. 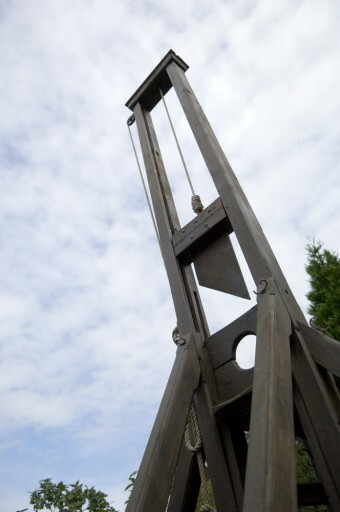 The guillotine was adopted as France’s official method of execution on March 20, 1792, and remained so until the death penalty was done away with in 1981. When the guillotine was instated, it was seen as an egalitarian way to dispatch justice in capital cases, unlike the old system that was unapologetically biased towards the upper class. Before the guillotine, aristocrats underwent relatively painless executions by being beheaded, either by axe or by sword. Commoners, on the other hand, could be hanged, burned at the stake, broken on the wheel, or made to suffer many other sorts of horrible, lingering deaths. The guillotine, to the revolutionary mind, provided a level playing field. What about ANZAC Day? The day that the ANZACs landed at Galopoli.